Phoenix Rising FC did anything but disappoint their fans last night, with a victory of 4-2 against the Swope Park Rangers in a playoff game. The soccer team has now moved forward onto the United Soccer League Western Conference Finals. A record of 7,707 fans came to show their support for the team last night, along with the two major fan bases that are always there, Los Bandidos and The Red Fury. Despite supporting the same team, Los Bandidos and Red Fury both have major differences when it comes to their overall platform. Members of Los Bandidos have very strong political opinions and use “nicknames” to identify themselves in the group and raise awareness for social and political issues within the United States. Red Fury members primarily focuses on the game and use the experience as an opportunity for everyone to just interact and bond over the sporting event. “I think between an organized group like us it helps to have separate identities, backgrounds, and walks of life because you gauge a better sense of ideas and organize off different mindsets better that way. Once you have a group that is really united it goes to show that when people believe in something it transcends background, religion, and economic status.” said El Sub Comandante, a member of Los Bandidos who preferred to give an alias instead of his full name. “It’s no secret Los Bandidos are a little bit more political and Red Fury tries to stay apolitical. I mean there are certain things we will not stand for. We supported Red for Ed and they had a charity thing for every goal we scored in June. But I like to think that the supporter group relationship has a lot of respect to go on both ways and we both respect each other’s style and do our own thing on game days.” Said Justin Zibber. Los Bandidos started two years ago, and their members come to every game to show love and support for their team but use their platform to bring awareness to Latino rights and use banners and posters to express their views on racism and fascism. “Being anti-fascist means that you do not stand for any authoritarianism and you don’t stand for any type of nationalism, racism, bigotry and even less from a body of government. Being Anti-fascist, you have a lot of government officials or even people on the streets like white nationalists who pretty much aspire to have these ideas being executed within the government. So, the reason why we do that in a soccer stadium is to create a platform against that very message.” said El Sub Comandante. The Red Fury has been around since the Phoenix FC Wolves days (2013) and have always been for the team and about the team with more Americanized customs, while Mr. J, another leader of Los Bandidos and El Sub Comandante both had prior experience with bringing an international flare to the group. “The songs that we sing, instruments we play with, the way we dress and make our banners, draws inspiration from groups around the world. Groups from South America, Mexico, and Europe. “said Comandante. 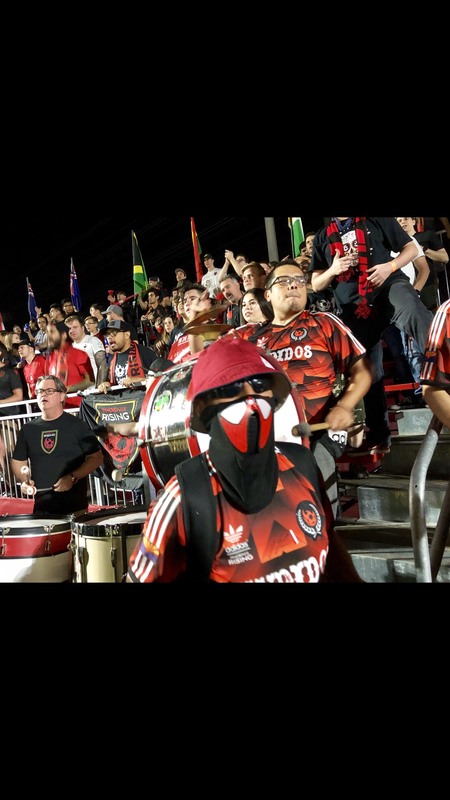 Even though Red Fury and Los Bandidos have different styles with the way they show their love for the Rising, the two can always unite and come together to cheer on Phoenix Rising when it is needed. In Friday’s game the two different fan bases joined forces by banging together their drums, clapping and getting the supporter section to chant and sing. “We love you, we love you, we love you, and where you’ll go we’ll follow, we’ll follow, we’ll follow. Because we support the Rising, the Rising, the Rising, and that’s the way we like it, we like it, we like it….” chanted fans in the supporter section. “This season really brought us together, there are those away days where we would all go together and help them with charity events. We have just kind of looked at each other and said we are all here together, let’s just do it. And it has been perfect,” said Zibber. Michael Lopez, a fan of Phoenix Rising that was in the supporter’s section, spoke about how crucial both fan bases are to the team and the rest of the fans in the stadium.